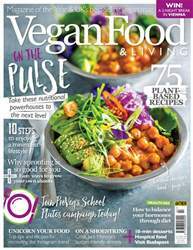 Us vegans often have our finger on the pulse when it comes to trying and discovering new ingredients to get creative with int he kitchen, but sometimes it’s nice to go back to basics with pulses. Not only are these little magic beans (and legumes!) cheap and easy to find, they’re a great source of protein, fibre and iron. So with that in mind, we’re celebrating the not-so-humble pulse in this issue, showing you how to use these everyday staples in a variety of simple yet impressive recipes (p12).